Our Bamboo Socks Gift Packs for Men and Women featuring our bamboo rich socks. They are really soft and comfortable to wear. For even greater comfort, they are made with a flat seam at the toe. Choose from our popular Men’s or Women’s Sock Boxes containing 4 pairs of Special Edition socks. In addition, we offer our Socks in a Bag for Women, which contain two pairs of socks. Finally, whether they are for Christmas, Birthday Presents or just for yourself, our Bamboo Socks Gift Packs are sure to please. 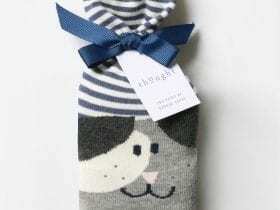 These unique Ladies Woof Socks in a Bag contain 2 pairs of Special Edition designs of Bamboo socks for Women, 1 pair of each design. The socks are anti-bacterial, anti-fungal and are really soft and comfortable to wear. For even greater comfort, they are made with a flat seam at the toe. 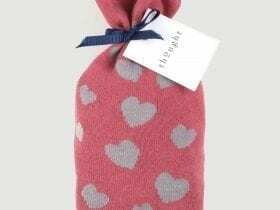 These unique Ladies Hearts Socks in a Bag contain 2 pairs of Special Edition designs of Bamboo socks for Women, 1 pair of each design. The socks are anti-bacterial, anti-fungal and are really soft and comfortable to wear. For even greater comfort, they are made with a flat seam at the toe. These unique Women’s Hygge Gift Boxes contain 4 pairs of Special Edition designs of Bamboo socks for Women, 1 pair of each design. The socks are anti-bacterial, anti-fungal and are really soft and comfortable to wear. For even greater comfort, they are made with a flat seam at the toe. These unique Women’s Storm Gift Boxes contain 4 pairs of Special Edition designs of Bamboo socks for Women, 1 pair of each design. The socks are anti-bacterial, anti-fungal and are really soft and comfortable to wear. For even greater comfort, they are made with a flat seam at the toe. These unique Women’s Rainy Days Gift Boxes contain 4 pairs of Special Edition designs of Bamboo socks for Women, 1 pair of each design. The socks are anti-bacterial, anti-fungal and are really soft and comfortable to wear. For even greater comfort, they are made with a flat seam at the toe. These unique Ladies Meow Socks in a Bag contain 2 pairs of Special Edition designs of Bamboo socks for Women, 1 pair of each design. The socks are anti-bacterial, anti-fungal and are really soft and comfortable to wear. For even greater comfort, they are made with a flat seam at the toe. These unique Women’s Christmas Animal Gift Boxes contain 4 pairs of Special Edition designs of Bamboo socks for Women, 1 pair of each design. The socks are anti-bacterial, anti-fungal and are really soft and comfortable to wear. For even greater comfort, they are made with a flat seam at the toe. These unique Women’s Forest Finds Gift Boxes contain 4 pairs of Special Edition designs of Bamboo socks for Women, 1 pair of each design. The socks are anti-bacterial, anti-fungal and are really soft and comfortable to wear. For even greater comfort, they are made with a flat seam at the toe. These unique Men’s Classic Cars Socks Gift Boxes contain 4 pairs of Special Edition designs of Bamboo socks for Men, 1 pair of each design. The socks are anti-bacterial, anti-fungal and are really soft and comfortable to wear. For even greater comfort, they are made with a flat seam at the toe. These unique Men’s Soccer Gift Boxes contain 4 pairs of Special Edition designs of Bamboo socks for Men, 1 pair of each design. The socks are anti-bacterial, anti-fungal and are really soft and comfortable to wear. For even greater comfort, they are made with a flat seam at the toe.